When a baby is added to a family it is always a call for a celebration!! Oh Baby! I can't help myself to get excited for people I love to add these new little additions. I am pretty sure I will get to be an aunt to a few more babies in the eventual future and that is super special because I feel apart of that little one's life. I even will give them little neck kisses because that is my favorite place to kiss my kids/nephews/nieces when they are brand new. So I am excited for that to eventual happen although I am patient concerning that. But currently a pretty great second to a new niece or nephew is that I have a very close friend that is having a baby ASAP. Yay!! She is a great friend that is very deserving and I know I am so lucky to call her my friend. 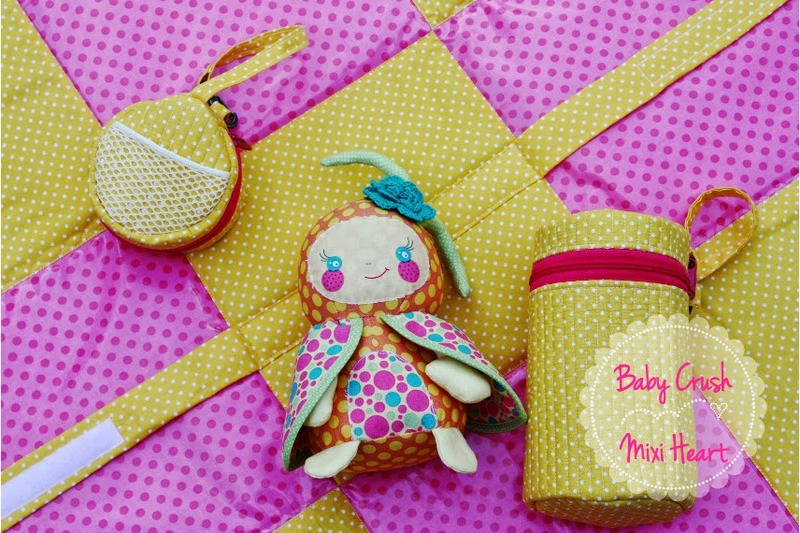 A new baby is a great opportunity to make some little items that are special for her new arrival to express how special she is to me. I came across a wonderful Pattern by Annie. It is the cutest!!! I knew it would be perfect to sew up for Crystal because I am positive no one will be making/giving her the same thing. Which is a score. 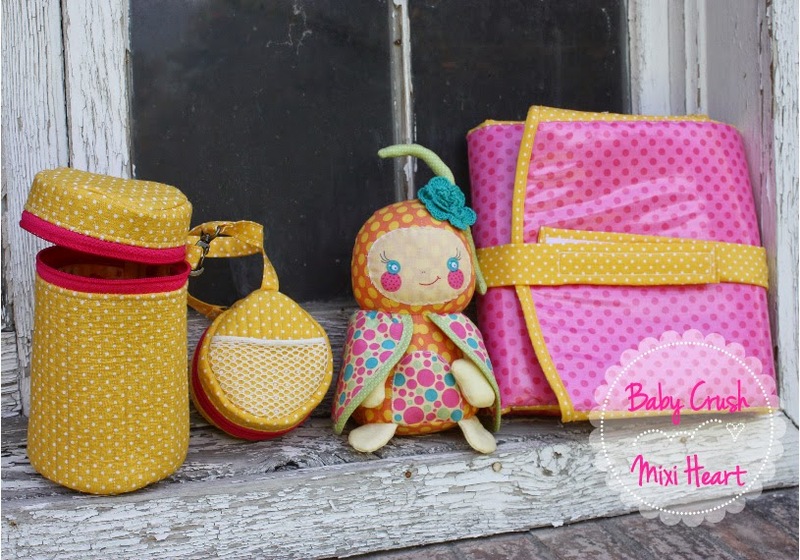 The pattern includes directions to make a changing pad, bottle holder, and binki holder. Also before I forget, I made a super cute stuffed ladybug by Melly&Me. The ladybug is so freaking cute too and it was fun to make. 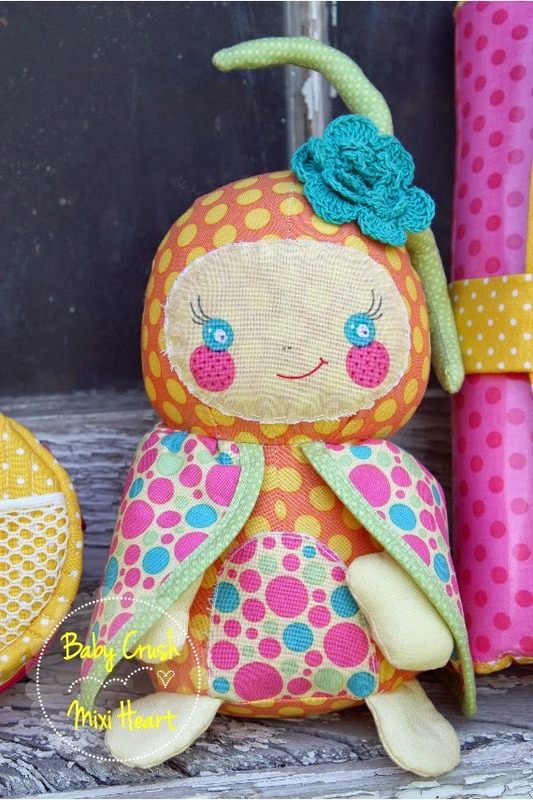 I have NEVER made a stuffed doll and I would definitely venture down that path again no question. So the Binki Holder is suppose to have both of the mesh pockets on the inside and mine isn't exactly made that way. Well, because I pinned it to the wrong side and then when I realized... I didn't really want to unpick all those little stitches. SOOOO it is completely unique :) And I think it will work out really well for Crystal. I think that it would be really cute with a little jar of baby food inside and then a binki on the outside, so there ya go. Improvisation. I have used a combination of laminated cotton and regular quilter's cotton fabrics. I think the laminate will be great to wipe clean. 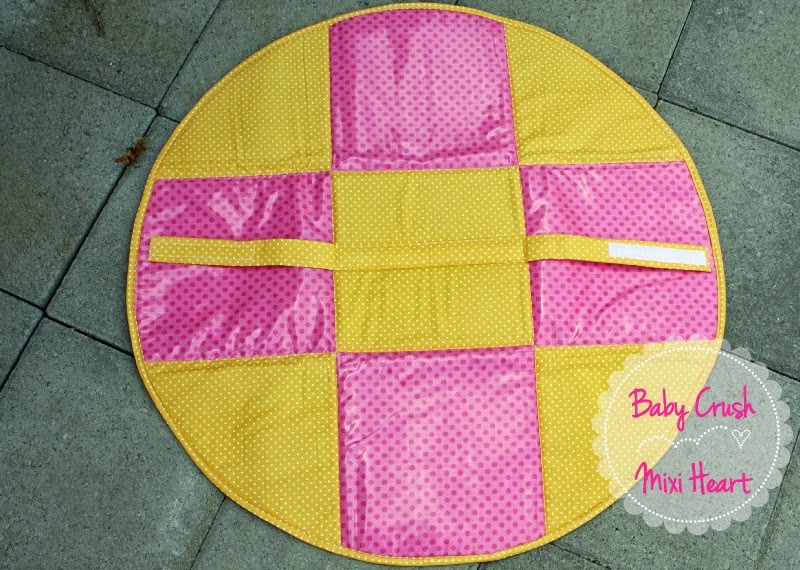 The pattern is a wonderful concept because it is a circle that opens for a playmat. Her patterns call for a foam batting that really helps things hold their shape. 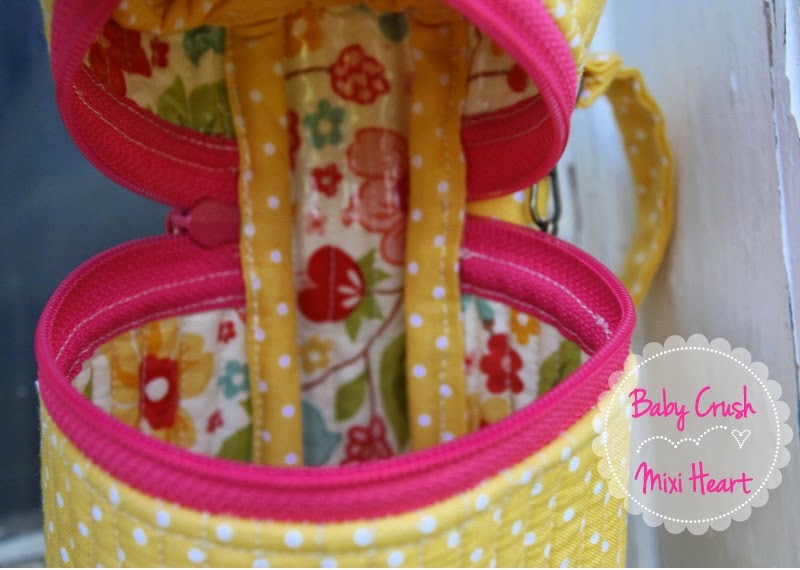 I have used her Soft and Stable a few times before in my backpack pattern plus a few other projects. 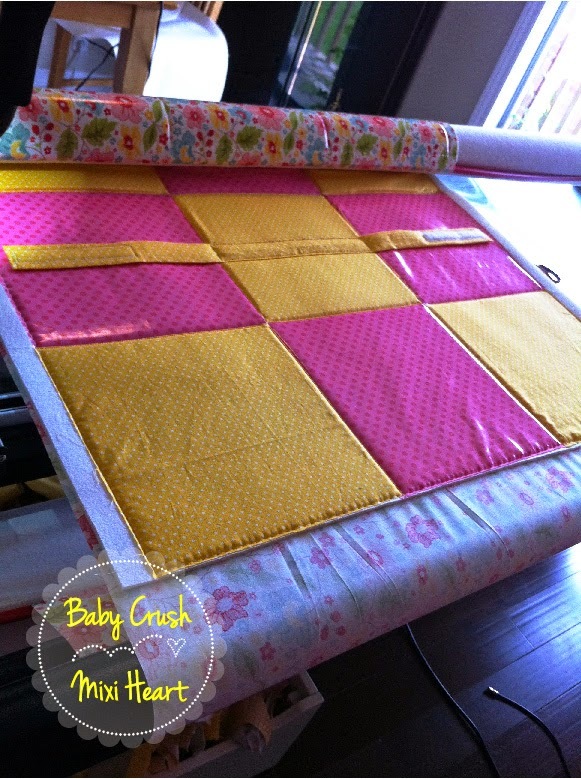 The strap in the center of the mat holds the changing pad together once it is folded up. 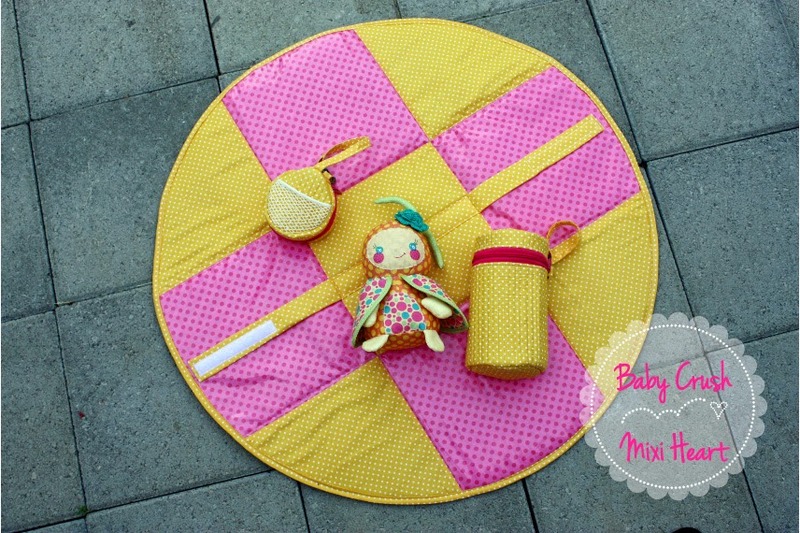 The underside of the playmat includes four pockets to tuck wipes and diapers into and perhaps a change of clothes because those babies are MESSY. I have the little ladybug tucked so you can see how the pockets work. 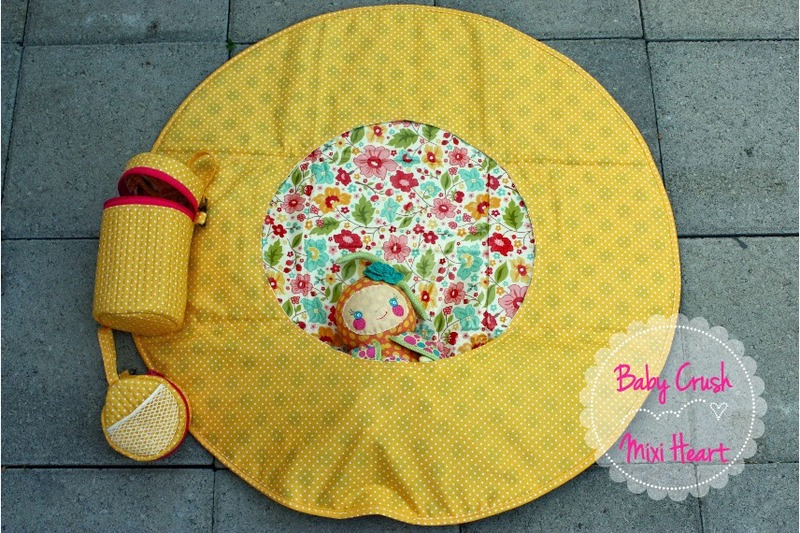 Here is the pad all folded and stacked next to all the baby delicious items. The little lady bug is cute. Look at that flower! Annie also carries zippers by the yard. 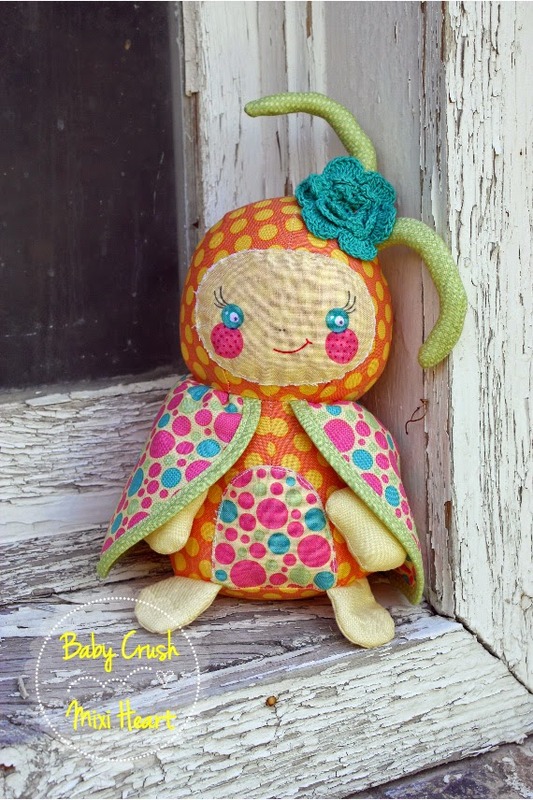 Can ya tell that I might have a pattern designer crush as well (well I am just so impressed with her, I can't wait to make another pattern she has designed). I have never bought zippers in this fashion but it is so smart. I thought about mixing zipper heads because I have a cream set as well but in the end I didn't. I know I am boring. Maybe one day I will get crazy and change my zipper heads. I now have on my list to get a zipper set in every single color, because you just never know when you need a zipper. I find that I love to keep things on hand and that it works well in my creative process, lol. It is just a matter of slowing building up those supplies/stash. I am not going to tell you that I didn't have to unpick because I did a few times. I know I would have a much easier time making these again. Perhaps I would have to unpick less the second or third time. I feel like that with most sewing patterns. I usually can ease through quilting patterns with NO PROBLEM AT ALL, but sewing patterns sometimes I need to make two. Speaking of TWO. 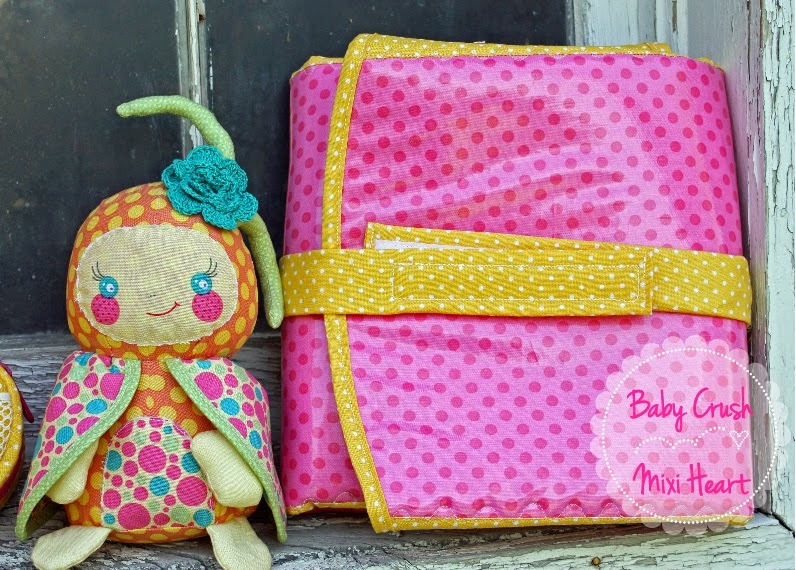 I did make two of these changing pads. The first one I made on my domestic machine and it was made in boy colors for another baby that is on it's way for a friend of my husbands. The second changing pad I thought "hey I wonder if it would be fun to make this on the long arm". The whole while I was thinking of the redneck jokes - like you might be a longarmer if you starting sewing projects on your long arm. :) If you are a longarmer you should get a chuckle because I am absolutely sure I am not the only one that laughs at how much we rely and love our long arm quilting machines. Plus I am sure I am not the only one that has ventured to sew a complete project on the the long arm. It really was a piece of cake sewing it on the long arm. I quilted the squares and then added the velcro strap. Then I unloaded the project and loaded it back on the opposite direction. Then I added the pocket. What made it easy was having the whole piece flat when quilting/sewing. I liked that. Well I am excited to pass these on to the new baby as soon as she arrives and I definitely have a little Baby Crush because I keep thinking about when she will make her debut and I am super excited to show her that I am happy for her to come into this world and make Crystal's life a little more complete. Plus babies are adorable! That is an adorable set! I love it and I bet your friend will too. 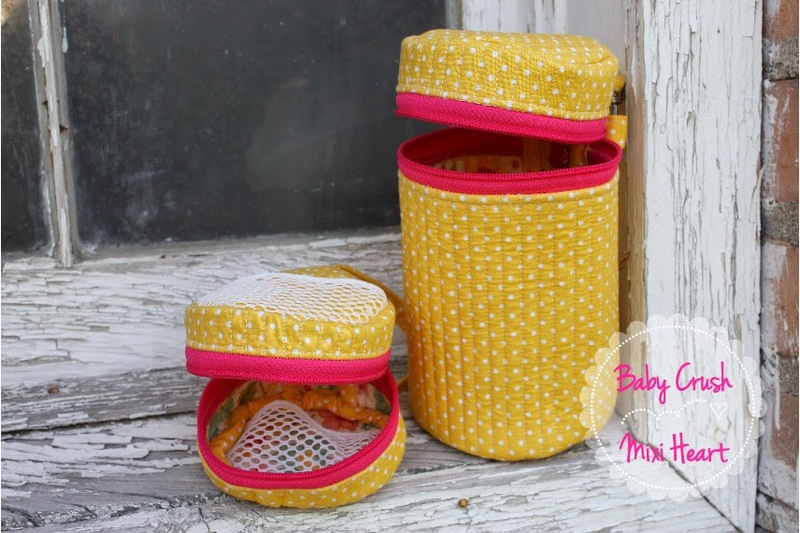 I love how bright and happy all of it is-you pick out wonderful fabrics for your projects!